Michelin stars and flip-flops -- incompatible like oil and water, yet Spain managed to turn them into an emulsion that seduced the foodies from all over the world. I have agonized over the restaurant choices for our trip to San Sebastian and Barcelona for months, and have established an intelligence network that would put CIA and NSA to shame. I have plowed through endless reviews on Micheline, Yelp, TripAdvisor, Google, Seriouseats.com, New York Times, blogs, and verbal accounts of numerous friends who have been to Spain. I jumped through all the hoops to get the most coveted reservations. I made sure that not a meal was wasted on the tourist traps flaunting pictures of paella. Our 12 days of non-stop eating were not without fascinating discoveries. Deliciousness was lurking everywhere from the most casual bars to 3 star Michelin restaurants. 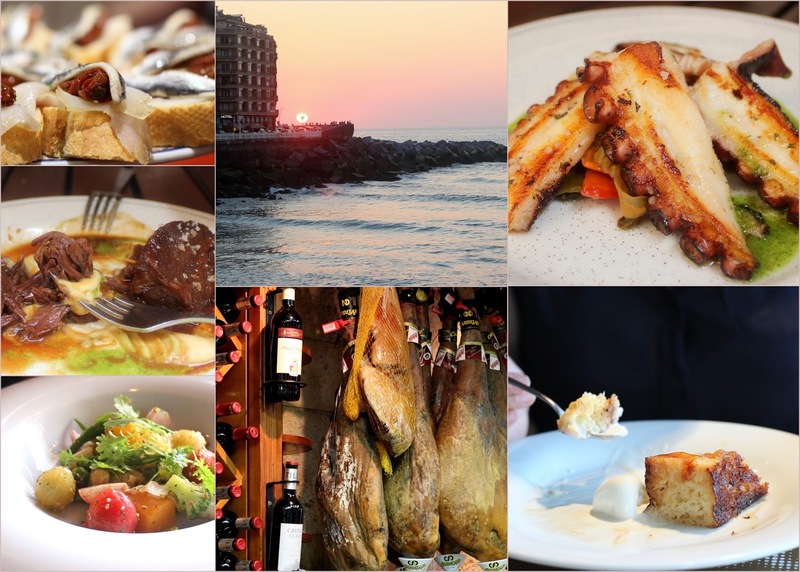 As much as I love seafood in Boston, the pristine freshness of every denizen of the ocean that I had the pleasure of eating in Spain was a step above. From baby monkfish to barely cooked lobster and succulent octopus, every bite seemed pure and vibrant. The highlights of our trip were Ni Neu in San Sebastian, Tickets and Etapes in Barcelona, and Sant Pau in Sant Pol del Mar. You are not likely to see an article in Saveur or New York Times about where not to eat in Spain. You won’t make too many friends writing bad reviews, but someone should do it. I would welcome such information before our trip since my list of places to try was way longer than the number of meals we could possibly eat in 12 days. The memorably terrible meals for us were at Mugaritz near San Sebastian and Pla in Barcelona. One more word of advice about San Sebastian. Many restaurants go on vacation from mid-June to mid-July. They don’t always announce this on their websites. If you have your heart set on a restaurant, e-mail them to ask if they’ll be open during your trip. You might have to eat standing up and fight for your square foot of counter space tooth and nail, but it’s all worth it. Every dish was so good I wanted to lick the plate. The octopus, the veal cheeks, the pork rib, and pig’s ear with ramesco were the highlights. This is our favorite sit down place in San Sebastian. Their affordable tasting menus (around 33-40 euro) are perfectly executed and employ innovative cooking methods without flaunting them in your face. The humbly named mixed vegetables with cheese broth was a work of beauty. Every vegetable was handled differently to best show off its texture and flavor. Some were roasted, some sauteed, some shaved into ribbons and left raw. The same attention to flavor and texture was present in every dish from roasted tomato stuffed with delightfully tender braised squid on a bed of squid ink rice to caramelized brioche bread pudding. Cuchara offers very competent cooking albeit with some inconsistency. The veal cheeks on a bed of chickpea puree were the best braised dish of our trip. The tangy braised veggies that came with octopus were both comforting and bright. Octopus was flavorful with a gorgeous sear, but chewy. The terrace was cozy, but pleasant and a more comfortable place to have a meal than Borda-Berri (Cuchara is its sister restaurant). Uninspired attempts at the classics. The atmosphere is quiet and slightly formal and the prices are extremely low (tasting menus are 25-40 euro), but the food shows lack of attention to seasoning, texture, and dish composition. “You don’t have to like it to like it,” says the chef of Mugaritz, Andoni Aduritz. That was a fair warning. I didn’t expect everything in this bleeding edge restaurant to taste good, but I didn’t expect it all to taste bad either. Unfortunately, it did. While at other restaurants food tastes bad due to incompetence, here it tastes bad due to a muscular research department (this is not a joke -- they do have one). The experience reminded me of the music of Schoenberg, Berg, and Webern -- intellectually stimulating, but terribly unenjoyable. The perpetual blandness of food turned out to be intentional. During a kitchen tour, one of their 40 cooks explained to us that they cook low-sodium to let the ingredients shine. The textures weren’t much better. Some of the dishes make a Japanese Kaiseki meal seem as accessible as meat and potatoes. I wasn’t surprised that the summer truffle looked like dirt. Those trompe l'oeil tricks are a dime a dozen at this kind of restaurants. The surprise was that it tasted like dirt. The pork was wrapped in a cracking looking cylinder. It looked and smelled very tempting, but tasted like pork flavored plastic. No amount of aggressive chewing managed to make a dent in breaking it down to parts that were safe to swallow without scratching your throat. The raw red mullet was tough and chewy and would be better served with dental floss than with the terribly bitter cherries. I’ll spare you the details of a very long list of dishes. Be assured that an awful lot of effort went into the preparation of each one and the result did evoke a strong emotional response from me. Maybe that was the chef’s goal. Surprisingly pricey rustic food in formal setting, but every dish was perfect. The white asparagus was the juiciest I’ve ever eaten and all the other grilled vegetables were delightful. Lovely (although very pricey) whole turbot. The portions were very large so it was easy to share. Light, refreshing, tangy cheesecake with raspberry sauce. Although the food was very tasty, the service left much to be desired given their prices. This rustic restaurant offers unpretentious good home cooking. They got me to like a grass-fed steak which is no small accomplishment, but I wish the tuna was cooked less and salt cod more thoroughly desalted before cooking. Worth a visit if you are in Hondarribia, but I wouldn’t make a special trip. We just got back from a trip to Barcelona with kids. Had a chance to revisit our favorite restaurants (minus the Micheline starred ones that wouldn't work too well with kids) and to find a few new gems. Etapes is still our favorite restaurant (so good that we went 3 times), but it is now tied with Cafe de l'Academia. We went twice and everything we tried was delicious. They are only open on weekdays and you need to call to make a reservation (there is no on-line option, not even an e-mail address), but it's worth all the trouble. The raw cod with romesco, octopus rice, rack of lamb, fish soup, turbot, and cod were all outstanding. For desserts, we preferred the orange sorbet and prune armagnac ice-cream to the pastry offerings. Paco Meralgo was wonderful -- octopus with caramelized onions was so good, the kids made us order a second plate, and their little cream filled pastries were my favorite dessert of the whole trip. I have mixed feelings about Espai Kru. The raw fish offerings were a mixed bag. Some had great texture, some didn't. Some were seasoned just right, and some were under-salted. Mushroom risotto and crawfish croquetes were lovely and the bread pudding dessert was out of this world. Pau Claris 190, Agust, and Montiel were disappointing. Prepare for a long wait or come early. The good dishes were out of this world, but you might have to kiss a few frogs before you find your prince. The monkfish with potatoes was outstanding, and puff pastry dessert was perfect. Mussels and clams were plump and tasty. Tuna tartare and fried artichokes were lackluster (both needed salt and acidity). Very pretty restaurant with great prices, but the ratio of good to bad dishes doesn’t warrant another visit. Salt cod with beans and vegetables was outstanding. Everything else was just ok. So many great little dishes and only a few were less successful. Gazpacho, raw tuna, cuttlefish croquette, deep fried salt cod were all winners. This is a review of the restaurant Pla not to be confused with Bar del Pla (which we didn’t try). The food was consistently terrible: stringy and tough corvina ceviche, lifeless piece of monkfish cooked sous-vide and rewarmed but not all the way through, stewed fennel that tasted like mush studded with tough fibers, scarily salty anchovies combined with completely bland eggplant swimming in gazpacho. Very cute and cozy atmosphere in a tucked away gothic quarter location makes it look like a hidden gem to many tourists. This is one of the few places in Barcelona that opens early, so if you want breakfast before 9am, this is a good option. The chickpeas were outstanding! So good we went back for them twice. But be careful about getting their croissants early in the morning (we were there at 8am). They were stale. Rustic dishes with contemporary presentation were fun, but they didn’t always taste as good as they looked. Wild mushrooms with port sauce were very tasty after we added some salt. The baby-squid with julienne of vegetables would have been stunning if the squid weren’t loaded with grit. The steak tartar was overwhelmed with whole grain mustard (I love mustard, but this was over the top). This is probably the most hyped up restaurant in Barcelona, which made me nervous. But it was indeed fantastic. The dishes drew inspiration from all over the world. They bore little resemblance to the original in preparation, but captured the spirit of the dish and offered what tasted like a platonic ideal of it. The service was friendly and neither hip nor formal as often happens in these kind of places. We had a chance to try a huge variety of dishes and most of them were delicious. Yes, there was a lot of trompe l'oeil and gimmicky presentation, but underneath all that were some very innovative textures that offered an improvement on already tasty classics. We let our server choose the dishes for us. Many of my favorites were the ones I would never have ordered. Take their pizza for example. It was a cold dish, and I am sure not a single step in its preparation resembled a traditional pizza, but it gave me everything I love about pizza 10 fold: shatteringly crispy crust, intensely sweet tomato ripeness, and gooey salty cheese. The mushroom pasta was a creative way to use the tough and corpulent king trumpet mushrooms. When cut to the shape of spaghetti they offer a lovely al-dente bite and pack the dish with intense mushroominess. If you want to taste innovative and delicious food without having to sit for 3 hours or put up with napkin origami every time you get up to go to the bathroom, Tickets is worth the trip! Escriba -- the best croissants we had in Barcelona, especially the chocolate one. This was the most delicious meal of our trip. No ambitions to set trends, shock, or challenge you. It felt like all the energy was spent on providing a perfectly delicious and harmonious meal in a gorgeous setting. The lobster with strawberry gazpacho, the foie gras in dashi, the leechy and rhubarb dessert and incredibly creative cheese course were the standouts. Lots of Japanese influence here. Not surprising since the chef, Carme Ruscalleda has a second restaurant in Tokyo. 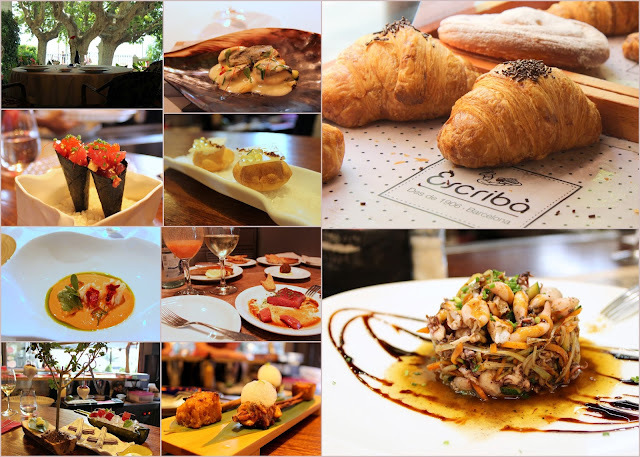 The “fusion” never felt forced or out of place and stemmed from Carme’s deep sensitivity and understanding of both cuisines. The cheese course was a delightful glimpse of her philosophy. We were offered three versions of the dish that had the same ingredients: the cheese, tiger nuts, and red pepper. The first version offered all ingredients in their natural state. It was a delicious combo that I could picture serving at home. The second version turned the red peppers into a flexible strip of jam and arranged just the right amount of cheese and nuts on top. All the delicious flavors were still there but more harmony and balance were imposed on them by the cook. The third version turned all the ingredients into an ice-cream that was both sweet and savory at the same time. It was served at all different temperatures. From the cold center to warmer edges giving you different consistency in every spoon. Here the cook didn’t just impose harmony and structure on the ingredients, but made a whole other entity out of them. Sant Pau is not only worth an hour train ride from Barcelona (it goes along the lovely Mediterranean beaches), it’s worth crossing the Atlantic. If I lived in Barcelona, Etapes is where I would eat all the time. It was the most delicious normal meal of our trip. By normal, I mean that we didn’t need to jump through hoops to get a reservation, the food didn’t not come hanging on trees or plated on iPads, it was neither too rustic nor too molecular, and it was incredibly delicious. Tuna tataki (barely seared on the outside, raw inside) was served with soy jello and wakame seaweed that was briefly sauteed in oil. A really fun way to apply western techniques to Japanese ingredients. Octopus a la plancha with a delectably rich potato puree was the best octopus dish of this trip. Duck ravioli in a foie gras sauce was as decadent and delicious as it sounds. Lobster was sweet and translucent. The braised lamb shank showed off a perfect lamb stock reduction coating silky meat. Both tiramisu and “textures of chocolate” desserts were tasty, updated versions of the classics with modest amounts of sugar. Some dishes were less successful. Salmon tartare came with a strangely tough garnish, and roasted pork was overly sweet and needed salt, but those felt more like exceptions in an otherwise delightful meal. If only their A/C worked -- summer in Barcelona without A/C is brutal. But they do have it, and I have a feeling it might have just been broken temporarily. Away from the tourist crowds is this little gem of a restaurant. The food feels a bit homier and simpler than Etapes. Very tasty tuna tartar -- no interesting twists here, just perfectly tender and nicely dressed tuna. The salt cod croquettes were so good we had to order a second portion. I don’t normally like croquettes, but these were so light, creamy, and not overly salty that even I was smitten. The chickpeas with mushrooms were simple and perfect. The bass ceviche was tender, tangy, and well seasoned. The steak, salmorejo, and raspberry napoleon were uninspiring. But considering very reasonable prices and extremely varied menu, Silvestre is worth returning to. I really wanted to like this contemporary restaurant, but I didn’t. The pigeon dish was stunning (perfectly tender, very rare breast, and pigeon liver croquettes that popped in the mouth spilling their deliciously creamy contents). Everything else tasted off balance to me. Many dishes (including some savory ones) were way too sweet to my liking. Salt use was sporadic (sometimes way too much, sometimes not enough). More thought seemed to be given to what kind of plate to present the dish on than how to make it taste good. Thank you for this wonderful post and your always greatly appreciated blog! I love the accessible combo of down-to-earth (or should I say sea?) yumminess, experimental rigour, and haute-cuisine elements.